The TRACE MODE® 6 development system offers an unrivalled power and flexibility in the integrated process control and manufacturing automation systems development, combined with intuitiveness and ease of use. The TRACE MODE 6 development system consists of the Integrated Development Environment (IDE) and of the real time debugging monitor – profiler. MES-EAM-HRM – the TRACE MODE’s economical modules associated under the common name of T-FACTORY.exe®, used for development of manufacturing management automation systems fully integrated with process control. In the TRACE MODE the multi-user project development technology is implemented (for that purpose, an additional server for workgroups and development system of the professional line would be required). The control algorithms for all levels of the control system are programmed in the same IEC 6-1131/3 standard languages. All the TRACE MODE project nodes, for example controllers, HMI, EAM and MES servers, have the uniform distributed database and the links between them can be made automatically by the autobuilding technology. Therefore, the calculations could easily be transferred from a computer into a controller, or vice versa. All the editors are closely integrated with powerful debugging facilities, providing an outstanding ease of use and maximal comfort in development of control and manufacturing automation systems. All the components of the TRACE MODE project – HMI screens, programs, SQL-queries, templates of documents, channels of the TRACE MODE and sources of data are linked between each other via arguments. The arguments allow to obtain maximum of flexibility while creating connections between individual components. For example, the data from a program in a controller could be connected directly with the HMI on the operator’s station or with the MES, and no additional channels should be created for this purpose. The IDE is provided with free library of I/O device drivers, covering over 2586 PLCs and I/O cards. Sources of data – signals from I/O devices and controllers are created and configured in the development system automatically by autobuilding. This allows to avoid errors of manual input and significantly reduce the time required for development of a project. 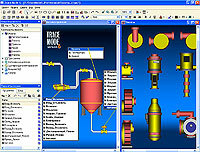 Integrated development environment allows to develop functionality of automated control system gradually, starting with a single HMI and finishing with advanced control system with hot standby redundancy, adaptive PID-loop self tuning, upscaling it to hundreds of additional HMIs, adding economic modules – the enterprise asset management (EAM), human resource management (HRM) and manufacturing execution system (MES). At that, a developer would not experience any psychological discomfort whatsoever, with a transfer, for example, from programming of HMI to SOFTLOGIC controllers or EAM, because, as the matter of fact, the editors, debugging facilities and programming languages used would be exactly the same. 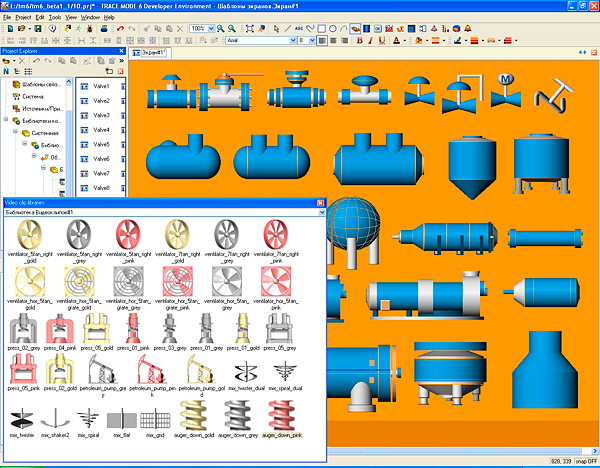 The TRACE MODE 6 can be adjusted to the developer’s skills. While creating a project, one can select a style of development: simple, standard or advanced. The TRACE MODE 6 integrated development environment can be started in parallel with the runtime module – Real Time Monitor (RTM) on a single PC, which is very convenient for online debugging. Edited project can be uploaded to the remote SCADA/HMI, MES, EAM, HRM PCs and to the SOFTLOGIC controllers. It can be run remotely with one click and edited online in the IDE. The TRACE MODE 6 development system is provided with a special real time debugging monitor – profiler. It is designed for real time debugging of control system project. The RTM profiler differs from an ordinary one in that it logs all its actions in a file. Like all the TRACE MODE programs, the integrated development environment is subdivided into the basic and professional lines. Development system of the basic line is free – this can be downloaded/ordered from the web site. 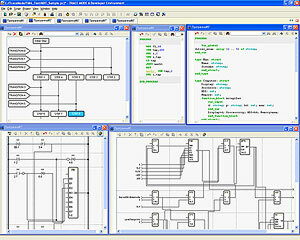 The TRACE MODE 6 integrated development environment is a unique combination of the richest possible functionality and intuitiveness of the interface. In practice the TRACE MODE integrated development environment advanced technologies allows to save up to 30% of working time and cost as compared with separated HMI editors and controllers programming systems. And the integration of T-FACTORY economical modules into the TRACE MODE SCADA/HMI opens previously unattainable possibilities for optimisation of the production in the whole.